Things seem to be returning to normal in Covington County (CoCo) as Straughn returns to 3A and the Bulldogs remain the largest school in the Cup with their 4A classification. That means the Straughn vs. Andalusia game can return to the "for bragging rights only" match-up and the fans can give it their all - knowing Win-or-Lose doesn't affect their playoff opportunities (not entirely true - if the tie-breaker rules come into affect/effect). Andalusia is coming off their fir st undefeated season in 35 years. WOW - 35 years. Straughn is dropping back to their comfort zone in 3A and hope to return to reigning region champs and will pick up a more meaning ful game with Opp in 3A Region 1. Andalusia vs. Straughn is a much anticpated rivalry among the students at both schools and faces and signs will pepper the stadium for this Friday Night season opening kick-off. While exciting it is fairly young compared to the heated Andalusia vs. Opp contest facing off only 10 times since their first meeting on September 16, 1994. 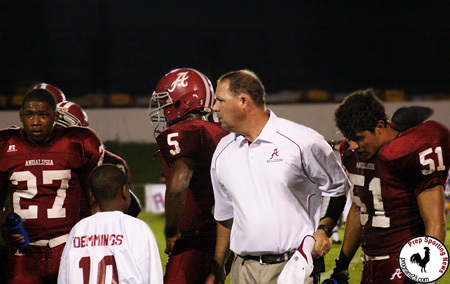 Straughn won 14-7, while Andalusia has a 7-3 record in the series including last season's 37-3 hammering. Which team has the advantage in 2012. The Bulldogs get the early favorite nod and should open up with a win, although expect a much closer / physical contest. A win would give the Bulldogs their longest winning streak over Straughn at 4.